I called Comcast to switch over my cable service to our new place. We will have our service shut off here tommorrow (since we are moving tommorrow). But we can’t get anyone out to our new house until june 7th. ugh! June 7th! I hope I can survive. I can access the internet at work, but I have to wait out the whole weekend (which goes through tuesday for me). sigh. so anyway, stay tuned, in the next few days, for a funny story that involves Mr. Potatohead. And have a fantastic and safe Memorial day weekend. 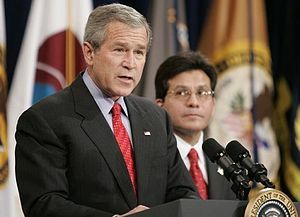 Attorney General Alberto R. Gonzales, the F.B.I. director, Robert S. Mueller III, and senior officials and career prosecutors at the Justice Department told associates this week that they were prepared to quit if the White House directed them to relinquish evidence seized in a bitterly disputed search of a House member’s office, government officials said Friday.